THOMAS K. MCCRAW believed that financial leadership in government really matters. Since this is an issue that is very much with us at the present, his work of history may have a special timeliness. In The Founders and Finance, McCraw (who died in November) contends that the secretaries of the Treasury during the several decades following the inauguration of the new national government of the United States in 1789, especially Alexander Hamilton and Albert Gallatin, were crucially responsible for putting the nation’s finances on a sound institutional footing. Indeed, he argues, their actions as government officials made possible the extraordinary explosion of entrepreneurial and capitalist energy in early nineteenth-century America. Burdened by this huge debt and other financial problems, the new country in the 1780s could easily have broken apart. In order to highlight the achievement of the Founders in creating the Constitution of 1787, McCraw tends to exaggerate the economic trouble of the 1780s. He even claims that the decade of “the 1780s was likely the worst decade in American history except for the 1930s.” In making such an exaggerated claim he has to set aside the work of such historians as Merrill Jensen, E. James Ferguson, and others. There certainly was economic dislocation in the 1780s, and traditional markets were closed to American merchants—but new ones were being found, even as far away as China, and people were on the move. The decade was actually a time of great release and expansion, and the general mood among ordinary people was high and far from bleak. “There is not upon the face of the earth a body of people more happy or rising into consequence with more rapid stride, than the inhabitants of the United States of America,” Charles Thomson, secretary of the Confederation Congress, told Jefferson in 1786. “Population is encreasing, new houses building, new lands clearing, new settlements forming, and new manufacture establishing with a rapidity beyond conception.” Indeed, as the demographer Jim Potter has pointed out, the 1780s were the fastest-growing decade demographically in all of American history. Since immigration was negligible in the 1780s (many Loyalists left the country), the extraordinary growth of population came from young people having high expectations for the future and consequently marrying earlier, which in turn led to their having more children. What seems to set the early secretaries of the Treasury apart from other American leaders is not just their status as immigrants, but also their previous mercantile experience and their familiarity with numbers. Hamilton and Gallatin had one or another of these advantages. So did Oliver Wolcott, Hamilton’s replacement at Treasury. Although Wolcott was not foreign-born—he came from an old Connecticut family—he nevertheless was an able secretary of the Treasury. BUT THIS THEME of foreign-born Treasury secretaries, interesting as it may be, does not dominate the book. Once McCraw completes his introduction he drops the theme, and slips into a more or less conventional political narrative of the life of Hamilton followed by the life of Gallatin. Much of his clearly written narrative about these two men’s lives goes well beyond financial matters. He devotes an entire chapter to Hamilton’s fatal duel with Aaron Burr. Hamilton’s great achievement was establishing a financial system in emulation of Britain’s. That Britain, a tiny island off the northwest coast of Europe with a third of the population of France, had come to dominate the world as no nation had since the fall of Rome was the marvel of the age. This eighteenth-century “fiscal-military state,” in John Brewer’s apt term, could mobilize money and wage war as no state in history ever had. Unlike France, Britain’s centralized administration had developed an extraordinary ability to extract money from its subjects without impoverishing them. The secret of the Hanoverian monarchy’s success, as Hamilton had come to appreciate, was its system of centralized tax collection and its funded national debt together with its banking structure capped by the Bank of England and its market in public securities. This system made possible the financing of Britain’s successful eighteenth-century war machine. Hamilton aimed to copy this British system. He proposed gathering together all the Revolutionary War debts of the Confederation and states and funding them, that is, transforming them into a more or less permanent debt on which annual interest would be paid. At the same time he proposed the creation of a national bank that would stabilize the credit of the United States and create money. He also projected the eventual development of manufacturing in the United States, not just to meet military requirements but also to create a more diversified economy that would be more self-reliant and less dependent on European supplies. Undergirding this financial program was Hamilton’s plan for a modern, hierarchically governed state with a bureaucracy, a standing army, and a strong navy. With Britain as his model, Hamilton thought that the United States would eventually, perhaps in four or five decades, become itself a strong “fiscal-military state” capable of taking on any of the European states on their own terms. But McCraw doubts that this fiscal-military state could have been Hamilton’s goal. “The idea and the reality of a ‘fiscal-military state,’” he says, “simply do not fit the political economy of the early Republic.” McCraw ignores the fact that Hamilton’s vision of a fiscal-military state was a long-term one, not something immediately attainable. It did indeed take a long time, much longer than Hamilton imagined. Only after experiencing the Jeffersonian state-centered society with a small national government of the antebellum period that culminated in a civil war did the United States begin to realize Hamilton’s dream, which took four or five decades following the nationalizing results of the Civil War. In 1790, Hamilton and his fellow Federalists could not foresee that long period of Jeffersonian minimal government and the development of egalitarian democracy. Hamilton was no fool. He knew very well that the American people were not yet ready for the kind of government that he envisioned. He told Washington in 1789 that “notions of equality” were as “yet ... too general and too strong” for the kind of high-toned society and government that he assumed would eventually develop in America. Hard as it is for us to understand, Hamilton and the Federalists actually thought that time was on their side, that—in accord with the theories of the stages of social development popular in the late eighteenth century—the society of the United States would sooner or later become mature, less egalitarian and more hierarchical, and even more monarchical. Of course, he and the other Federalists could not have been more wrong. This was only one of the many illusions that the Founders had about the future. SINCE MCCRAW seems unable to take seriously Hamilton’s vision of a fiscal-military state in emulation of that of Britain, he has no adequate way of explaining James Madison’s otherwise strange and sudden opposition to Hamilton’s program. Hamilton was certainly bewildered by Madison’s opposition. Hadn’t Madison been in the forefront of those in the 1780s who had fought for a stronger national government? Hadn’t Madison written the Virginia Plan, which was the model for the final Constitution? And hadn’t Madison joined with Hamilton to write The Federalist Papers in support of the Constitution? A mystified Hamilton could conclude only that Madison had succumbed to the views of his Virginia constituents and to pressure from his close friend Thomas Jefferson. This is essentially the explanation that McCraw relies on to account for Madison’s surprising change of mind. But such an explanation belittles the integrity and the independence of Madison’s mind. He did not oppose Hamilton’s program simply because he was concerned about his Virginia constituents or in thrall to the thinking of his friend Jefferson. He vehemently opposed Hamilton’s program because he rightly believed that Hamilton was trying to create the kind of fiscal-military state that he and other radical Whigs deeply feared. That was not at all the kind of national government that he had worked for in 1787. As a careful reading of his Federalist Number 10 reveals, Madison had expected the new national government to become a kind of adjudicatory body—to become, as he put it in a letter to Washington in 1787, a “disinterested and dispassionate umpire in disputes between different passions and interests” in the several states. In fact, he had thought that the new federal government might play the super-political neutral role that the British crown had ideally been supposed to play in the empire. So when McCraw says that Hamilton “was certainly no monarchist,” he is technically correct. But the Treasury secretary did admire the English constitution, and he did aim to approximate the English political and financial system as much as possible while keeping within a republican framework—perhaps, as some contemporaries noted, creating an American republican monarchy in the same manner that Augustus covertly created a monarchical empire while claiming to be continuing the Roman Republic. Nothing like a fiscal-military state developed in America over the next half-century, and so many historians, including McCraw, find it hard to take seriously all of Jefferson’s and Madison’s talk of “monocrats” and “Monarchical federalists.” Some of them have accused Madison of being paranoid; one of them has even claimed that Madison’s view “was, to speak plainly, nuts.” But Jefferson and Madison were sincere in their fears, even though we know now that they were mistaken. They and the other Republicans did not know their future any more than we know ours. THE REPUBLICANS’ fears more or less disappeared with Jefferson’s election to the presidency in 1800. Jefferson got rid of as much of Hamilton’s and the Federalists’ program as he could. He ended the formality and the pomp of the Federalist presidency, greatly reduced the minuscule army and navy, ended all excise taxes, and cut the government’s tiny bureaucracy to the bone, claiming that the offices under the Federalists had become “too complicated, too expensive” and had “multiplied unnecessarily.” But he was mortified that his government had inherited “the contracted, English, half-lettered ideas of Hamilton.... We can pay off his debt in 15 years, but we can never get rid of his financial system.” He hated all banks and wanted to get rid of the Bank of the United States, too, but his able secretary of the Treasury, Albert Gallatin, who knew about finance, banks, and credit, talked him out of it. Gallatin served as secretary of the Treasury for thirteen years in two different presidential administrations—the longest serving Treasury secretary in American history. Gallatin was born in the independent republic of Geneva in 1761 and therefore, unlike Hamilton, was a real foreigner. Although he had no prior mercantile experience, he had grown up in the busy city of Geneva, and he was smart, perhaps not as smart as Hamilton but a whole lot wiser. He had graduated from the Academy of Geneva first in his class in mathematics, Latin translation, and “natural philosophy,” that is, science. He came to the United States in 1780 as a young man of nineteen in search of land so that he could become a real gentleman-landowner. But he eventually came to realize that his talents lay not in land and agriculture but in the management of money and other financial instruments. After becoming a citizen in 1785, he entered the legislature of Pennsylvania as a representative of the western part of the state; and he soon began overseeing much of the state’s financial matters. In 1794, Gallatin was elected to the House of Representatives, where he quickly became a major force in the Republicans’ opposition to the Federalists. “His facility with numbers, his ability to absorb complex financial data, and his zeal in attacking Hamilton’s economic program,” writes McCraw, “made him a priceless asset to the Republican Party.” It was inevitable that he would become Jefferson’s secretary of the Treasury. Perhaps because he was a real foreigner, Gallatin had an acute appreciation of the difference between America and the Old World. America’s economic development, he said, owed much of its success to “the absence of those systems of internal restrictions and monopoly which continue to disfigure the state of society in other countries.” Although he supported the Bank of the United States and appreciated the sometime need for governmental borrowing, he was a good Republican in his desire to pay off the public debt and in his aversion to big government and to any sort of large military establishment. But more than many other Republicans, he believed strongly in internal improvements and in a diversified economy for the United States; and his “Report on Roads and Canals” in 1808 and “Report on Manufactures” in 1810 were state papers that rivaled those of Hamilton in vision and importance. He was less of a strict constitutionalist than Jefferson, and he helped to convince Jefferson to purchase Louisiana without waiting for a constitutional amendment. Gallatin was the hardest-working member of the administration and was always loyal to the president, even when he disagreed with him. He strongly opposed Jefferson’s and Madison’s visionary alternative to the use of military force—the embargo of 1807–1808, which withheld all international commerce carried on by Americans. If England’s violation of American neutral rights and its impressing of American sailors were to be stopped, Gallatin told Jefferson, the embargo was not the way to do it. He pointed out that enforcing such an embargo would be difficult and would seriously violate Republican principles. 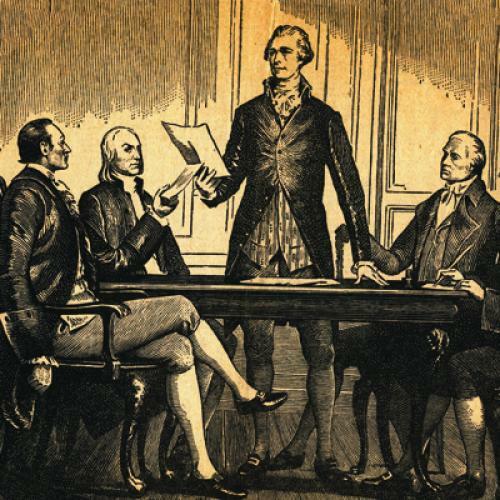 Perhaps owing to his sophisticated understanding of how economies worked, an understanding not shared by Jefferson or Madison, Gallatin realized that momentous actions by governments often had unintended consequences. “Governmental prohibitions,” he told Jefferson on the eve of the passage of the embargo act, “do always more mischief than had been calculated; and it is not without much hesitation that a statesman should hazard to regulate the concerns of individuals as if he could do it better than themselves.” This was wise Republican advice, but Jefferson ignored it. After fifteen months of the Treasury Department’s strenuous and harsh efforts to enforce the embargo, in blatant violation of the Fourth Amendment and all the drastic economic consequences that Gallatin had predicted, the embargo was repealed. War, which Gallatin had preferred to a permanent embargo, became inevitable. During the War of 1812 Gallatin managed the finances of the government as well as he could in the absence of the Bank of the United States. Despite his efforts on behalf of the Bank in 1811, the Republican Congress had foolishly refused to re-charter it. Although Gallatin had preferred war to the embargo, he came to realize that the war was a huge mistake. When the possibility of a negotiated peace opened up, he volunteered to be one of the negotiators. He became the leader of the motley American delegation in Ghent and was crucial in keeping it together. No one was more responsible than he for the peace treaty with Great Britain signed on Christmas Eve 1814. As McCraw points out, Gallatin went on to live a long and useful life. He became minister to France and later to Great Britain, and engaged also in several other diplomatic missions. In 1828 he moved to New York City, became president of the newly chartered National Bank of New York, and helped to found what became New York University. In his later years he became an expert on Native American ethnology and published two books on the subject. He was unsuccessful in persuading President Andrew Jackson to re-charter the Second Bank of the United States and unsuccessful in preventing America’s war with Mexico. He died in 1849 at age eighty-eight, having lived, as McCraw correctly concludes, “one of the longest, most honorable, and most productive public lives of any member of his generation.” One of McCraw’s accomplishments in his book is highlighting the significance of this much neglected figure. IN THE THIRD PART of his book, titled “The Legacies,” McCraw has four brief chapters on several desultory subjects: “Immigrant Exceptionalism?”; “Comparisons and Contingencies”; “Capitalism and Credit”; and “The Political Economy of Hamilton and Gallatin.” In the first of those chapters, he revisits his argument that immigrants were especially knowledgeable about finance and business, citing the additional examples of William Duer, Stephen Girard, John Jacob Astor, and several others to bolster his case. But his chapter on “Comparisons and Contingencies” is truly remarkable and strange. Actually, that may not be true: entrepreneurial forces unleashed by the Revolution and already visible in the 1780s may have been strong enough to survive and prosper even under a reformed Articles of Confederation. After all, the kind of federal government that Jefferson created after 1800 intentionally resembled the Confederation. Without the Bank of the United States, the states would still have had chartered banks. It is too bad that McCraw did not begin his book with this fascinating chapter and make its point the central theme of his book. It would have made for a much more original and accurate book. I say more accurate because, as McCraw suggests, most of the Founders were caught up in circumstances they scarcely comprehended, and they had little sense of where the future was taking them. Fast-moving developments overwhelmed nearly all their high-minded intentions. Hamilton especially misread the future and was never in control of events. He never really understood the way the American economy was developing. He and the other Federalists tended to favor big merchants and financiers and to ignore artisans, small businessmen, and farmers. He expected the Bank of the United States to create several branches that would eventually absorb the state banks and give the Bank a monopoly over the nation’s banking. Moreover, his Bank of the United States was intended to make credit available only to large merchants engaged in overseas commerce and others who wanted short-term loans of ninety days or less. At the outset most banks, including the Bank of the United States, did not want to get involved as yet with long-term mortgage loans to farmers—to do so would tie up money for too long a time. But that kind of restricted credit could not be maintained in a society that contained the largest proportion of voters in the world, nearly all eager to pursue happiness by making money. In spite of opposition from Hamilton and the Bank, ordinary farmers and entrepreneurs who wanted long-term credit pressured their state legislatures to create that long-term credit. The Constitution had in fact forbidden the states from issuing paper money, but the states got around this extremely limiting prohibition by creating dozens upon dozens of banks that issued the money that the entrepreneurial-minded population wanted, especially in the North. Every town seemed to want a bank. By 1818, Kentucky had forty-three new banks, two of them in towns that had fewer than one hundred inhabitants. The proliferation of paper money was not at all what Hamilton and the Federalists expected, and they were appalled by it, even though all the paper supplied the wherewithal that made possible the phenomenal growth of the American economy. IN OTHER WAYS, too, Hamilton and his fellow Federalists revealed their insensitivity to the entrepreneurial needs of ordinary farmers, artisans, and small businessmen. Despite Hamilton’s interest in economic diversity and manufacturing, he ignored the interests of the artisans and the manufacturers. Hamilton’s tariffs were not protective; they were revenue-raising. Indeed, he did not like protective tariffs, preferring giving bounties to the manufacturers instead. Those bounties tended to benefit manufacturers who exported articles rather than those who manufactured goods for domestic consumption. In fact, Hamilton and the Federalists preferred to think of commerce almost exclusively in the traditional terms of overseas trade. Consequently, they ignored the significance of the developing domestic market, which soon came to dominate American business in the burgeoning Northern states. It is thus not surprising that the artisan-manufacturers and other businessmen, who had been strong supporters of the Federalists in 1787–1788, now began going over to the Republicans in ever increasing numbers. Gallatin had a somewhat better understanding of what was happening. Although he supported the re-chartering of the Bank of the United States, he did not like—any better than the Federalists did—all the wildcat state banks and their emissions of proliferating paper money that was often insufficiently backed up by gold and silver. In fact, one of the reasons he so badly wanted the Bank to be re-chartered in 1811 was its ability to curb the state banks’ excessive issues of paper. For this reason, emphasizing “the agrarian nature” of the society as McCraw does—a society in which nineteen out of twenty Americans were farmers and in which “the principal economic interest among most segments of society was land”—is very misleading, since large numbers of that society, in the North especially, were becoming some of the most commercially involved people in the Western world, producing, selling, and buying among themselves to an extent that no one in 1789 had ever anticipated. And the economy that resulted was anything but orderly. In fact, it could not have been more wild and risky. Many businesses failed, but enough succeeded to allow the whole economy to grow. All this commercial chaos led many Americans increasingly to believe that America’s marketplace was uncontrollable and beyond the ability of anyone to manage. It had to be instead in the hands of providence, which many Americans soon came to identify with progress. HERE MCCRAW seems to be offering a very obvious message for our own time. In their promotion of credit and banking, the two statesmen “were defining one of the key elements in what came to be called capitalism—the system that would propel the phenomenal growth of the American economy.” But how responsible were these leaders for that growth? With all the bank bills flying about in the early decades of the nineteenth century, the nation’s system of credit was scarcely being managed by anyone. Its system of public credit had certainly spun out of control. By 1842, eight states and the Territory of Florida were bankrupt, and three others (out of a total of twenty-six states) were in very serious financial shape. This seems to suggest that the phenomenal growth of the economy in the early decades of the nineteenth century came largely from below, from ordinary people borrowing money and producing and trading things, not mainly from above, and not from the decisions of political leaders. McCraw’s brief intermezzo message near the end of his book in which he stresses contingency, uncontrollable circumstances, and an unknown and unexpected future seems ultimately to be what captures the reader’s mind. We may not know what we are doing with our own public finances, but perhaps we may take some comfort in the fact that the Founders, two centuries ago, did not know what they were doing, either.